Artisits (page in creation process) | Who Built Our Capitol? This section will include information on canvass and mural painters and on sculptors who designed works of art for the Capitol. The three dimensional artists, such as Daniel Chester French - credited with creation of the Quadriga, conceived of a form for the piece and made a model (often on a smaller scale) in clay or plaster. Stone carvers or metal casters made the final works based on the artist's models. 1902 Beam painting payroll. Frank Carstensen worked as a painter employed in rust proofing beams though he always named his occupation "carpenter" for the censuses. He was born in Denmark in 1871 and emigrated in 1895. He and his wife, Ester, also Danish, raised their family in St. Paul while Frank worked as a carpenter. 1902 Beam painting payroll. Edward Esboldt was born in Russia in 1878 and emigrated in 1888. He worked on the Capitol as a painter in 1902. Esboldt and his wife, Anna, raised a large family in St. Paul. 1902 Beam painting payroll. S.O. Felt was born in Sweden in 1836 and emigrated in 1878. He worked on the Capitol as a painter. Fellow painter Joseph Wampach also lived at this address. 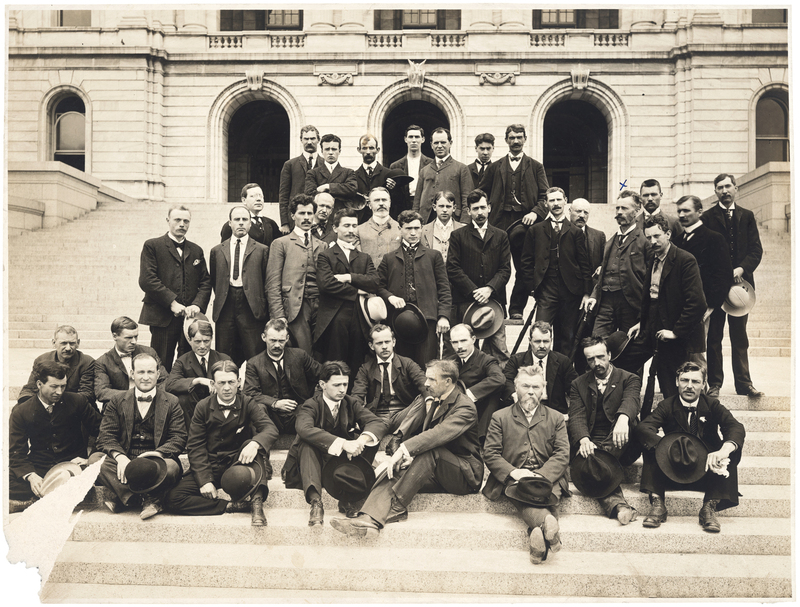 Most of the workers who constructed the Minnesota Capitol belonged to unions. However, it is not clear whether painters working in Minnesota were organized during the period when the Capitol was built between 1896 and 1907. So this worker's union status is currently unknown. 1902 Beam painting payroll. George Heck worked on the Capitol as a painter rust proofing steel beams. 110 Phalen Ck. is in what we now call Swede Hollow. 1902 Beam painting payroll. John Larson was a painter. This is where 402 Summit Place used to be located. 1902 Beam painting payroll. John Partridge was born in Canada in 1881 and moved to St. Paul about 1901. He worked on a painting crew rustproofing steel beams at the Capitol in March on 1902. This is where he and his wife, Annie, were living at the time of the 1905 Minnesota Census. We do not believe he was related to George Partridge of the firm, Bazille and Partridge, who got the contract for most of the painting on the Capitol. 1902 Beam painting payroll. William Provencher worked as a painter and stayed at The Argyle Hotel which would have been located about here. He was born in Minnesota of French Canadian parents in 1879. 1902 Beam painting payroll. Joseph Wampach was born in Minnesota of German parents in 1878. He worked on the Capitol as a painter and traveled around with his work, but eventually died in St. Paul in 1961. Painter S.O. Felt also lived at this address.